Polycystic ovary syndrome (PCOS) is characterised by a varied and often complex array of metabolic and endocrine abnormalities which can lead to long term health problems. Management should be individually tailored and lifestyle changes can play an important role. PCOS is characterised by a varied and often complex array of metabolic and endocrine abnormalities. The syndrome was originally described by Stein and Leventhal in 1935, as a triad consisting of amennorhoea, hirsutism and obesity, in women who had multiple cysts on their ovaries.1 Over the last decade or so, the understanding of this syndrome has changed and the emphasis is often on the long-term consequences that may occur. 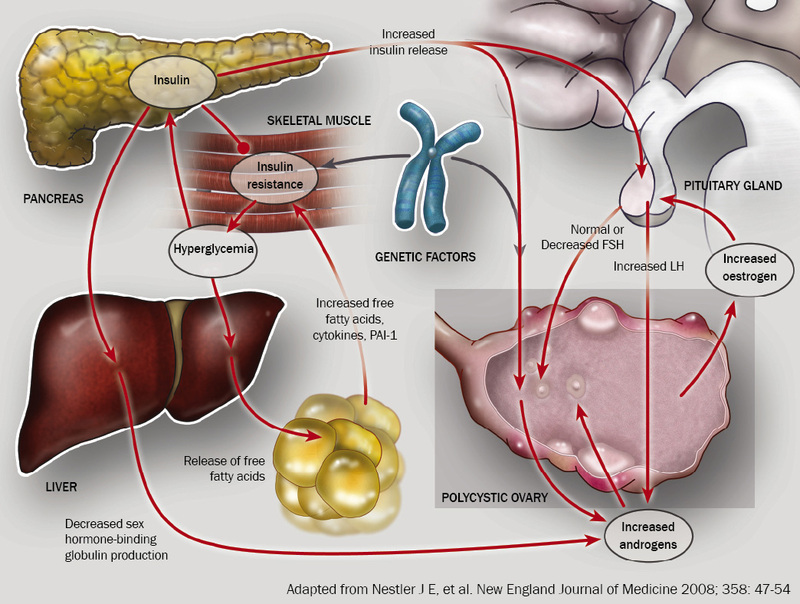 The pathogenesis of PCOS is not fully understood.6 There is some evidence of a polygenic component.7, 8 Insulin resistance is an important element in the development of PCOS but there are complex interactions involving many systems (Figure 1). Figure 1: Pathophysiological characteristics of PCOS. This figure illustrates the complex interactions underlying the pathophysiology of PCOS. Insulin resistance and the resulting hyperinsulinemia are responsible for the majority of the changes found in PCOS. There are, however, other factors often present in women with PCOS that may also contribute to these health risks. For example, unopposed oestrogens are a risk factor for endometrial hyperplasia and carcinoma. In addition, both diabetes and obesity have been linked to an increased risk of endometrial carcinoma. PCOS is a syndrome, so there is no single diagnostic test. Diagnostic criteria have been developed (Box 1) and widely adopted internationally. However, diagnosis can be difficult due to the variation in presenting symptoms and because symptoms differ with age at presentation and change over time. Although presenting features (Box 2), age of presentation and severity of PCOS vary, a common presentation may be of a woman with a history of gradually worsening hirsutism and irregular periods, which goes back for some years. For many women however, failure to conceive may be the initial reason for presentation. ** A brown-discoloured �velvety� texture to the skin typically in the region of the axillae and the back of the neck, often considered to be the cutaneous manifestation of insulin resistance (or hyperinsulinaemia). A clinical or biochemical finding of increased androgen levels along with either menstrual abnormalities or polycystic ovaries on ultrasound will satisfy the current diagnostic criteria (Box 1). The initial tests recommended for diagnosis are outlined in Table 1. While not essential for diagnosis, some clinicians still suggest testing LH/FSH. Once the diagnosis is established, fasting glucose and lipids are recommended. Other tests may be required depending on clinical suspicion, to exclude other conditions (Table 2). Important as part of the diagnostic criteria but not a “must do” if diagnosis is made on clinical and biochemical grounds. More sensitive for identifying physiologically active androgens. This is calculated from total testosterone and SHBG. Very high levels of total testosterone require further investigation to rule out other causes such as late-onset congenital adrenal hyperplasia, Cushing�s syndrome, adrenal or ovarian tumour. SHBG levels are decreased in PCOS. A fasting level may be useful in establishing cardiovascular risk. While not essential for diagnosis, some clinicians remain convinced of the value of LH testing in predicting future complications of PCOS. Lifestyle modification to reduce weight is the most effective first line treatment in PCOS.14, 16, 17 Even a modest weight loss of 5% will reduce central obesity and insulin resistance and improve endocrinological abnormalities and menstrual irregularity (including increasing the rate of ovulation).17 Ultimately, women who succeed in losing weight are more likely to achieve and have a healthier pregnancy and reduce their risk of gestational diabetes. Longer term benefits of weight loss result from the reduction in insulin resistance. Note that weight loss is not necessary if BMI is within normal range. Treatment may be required for acne and hirsutism, which are often the major reasons for women to present. Treatment options may include anti-androgens, topical agents (particularly for acne) and local hirsutism treatments (including electrolysis and laser therapy). The combination of acne, hirsutism and obesity is likely to lower self esteem in women with PCOS. Psychological support may be required and this may also help women achieve the recommended beneficial lifestyle changes. Fasting serum insulin is a poor measure of insulin resistance.18 Although used widely in large population-based epidemiological studies, it is not recommended for use in a general practice setting. It is more useful to identify the risk factors that are associated with insulin resistance (and often therefore identify metabolic syndrome and PCOS). These risk factors include raised fasting glucose and lipid levels, high blood pressure and central obesity. First line anti-androgenic therapy is often in the form of a combined oral contraceptive pill containing cyproterone acetate, and/or the diuretic spironolactone (usually 100�200 mg/day), which has an anti-androgenic effect. As a second line treatment, higher dose regimens of cyproterone acetate or spironolactone may be combined with oral contraceptive pill use. Limited data exist on prevalence between different ethnic groups in New Zealand. A cross-sectional study of women presenting to the gynae-endocrine clinic at National Women�s Hospital who were diagnosed with PCOS showed rates for European, Māori and Pacific Island women in proportion to the general population. If infertility is the main presenting problem, specialist referral is recommended. Clomiphene citrate is considered first line treatment.14, 22 To avoid the risk of over-response leading to multiple pregnancy, clomiphene citrate treatment is carefully monitored through a fertility clinic (with late follicular serum oestradiol levels and ultrasound scanning when appropriate). Weight reduction, if appropriate, remains central to the success of any treatment. Ongoing preventive screening of cardiovascular and endometrial disease risk factors is important when managing women with PCOS. There are no consensus guidelines in widespread use. A sensible approach would be to check BMI and blood pressure annually, along with fasting lipids and a glucose tolerance test every three to five years in patients with low cardiovascular risk, or every one to three years where other risk factors, such as obesity, are present. These consultations give women with PCOS the opportunity to review lifestyle factors to optimise their long term health. For women with anovulation who elect not to use endometrial protection, regular screening by transvaginal ultrasound and/or endometrial biopsy every one to two years is advisable.